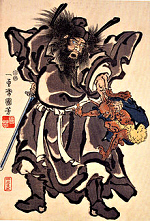 Shoki is deity of Daoism. Shoki is regarded as an eater of ghosts and evil beings. People hang paintings of Shoki in rooms as charms against evils. His image is also displayed for a success in academics.